So, today is grocery shopping day for the big Christmas weekend. My sister-in-law always hosts Christmas dinner, and she has asked me to bring a dessert, a salad, and rolls. Instead of playing it safe, I have decided to take a risk and try some never before tested recipes I have been craving on Pinterest. Blackberry Pie, my husband's favorite which I NEVER make. Christmas Eve, we will be going to church, and I just wanted something light and easy. What are you making for Christmas dinner, for Christmas Eve? Do you have special traditions or will you be trying something new? Thanksgiving is my favorite holiday because it is about family, food, and fellowship. For the past 16 years, Rick and I have hosted the holiday for his family and an occasional friend or two. We usually have between 10-15 people, and everyone brings something so it is not too overwhelming for one person. Last Christmas the girls and I baked our way through my Mom's 1959 Betty Crocker cookbook. Here is one of the funniest recipes we made, and a tasty one too. This post was originally published on November 16, 2010. WOW week seven in our 12 Cookies of Christmas! These thumbprint cookies are delicious and fun to make. Perfect size for little hands and appetites. My girls loved smashing the cookies with their thumbs. 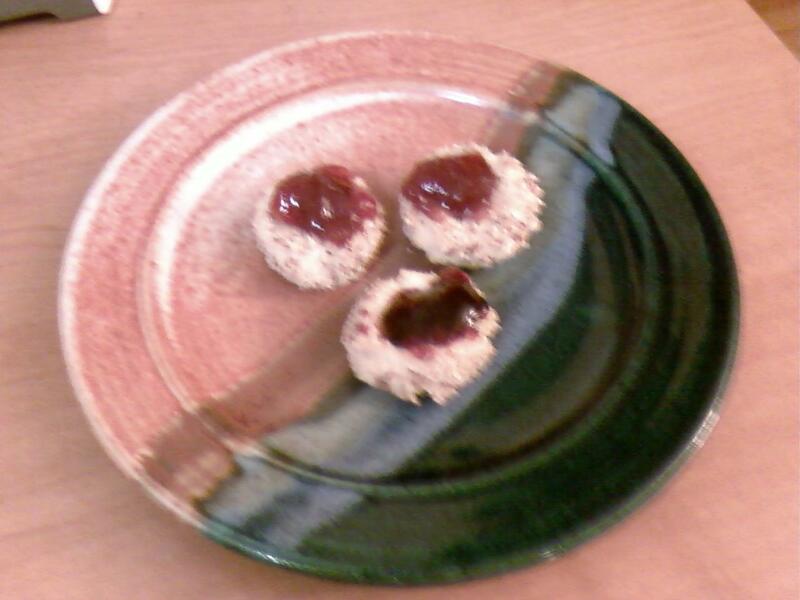 We used strawberry and grape jelly for the filling, and almond for the chopped nuts. My husband thought these were the best tasting cookies so far. Roll into 1" balls. Dip in slightly beaten egg whites. Roll in finely chopped nuts (3/4 cup). Place about 1"apart on an ungreased baking sheet. Bake 5 minutes in a 375 degree F oven. Remove from oven. Quickly press thumb gently on top of each cookies. Return to oven and bake 8 minutes longer. Cool. Place in thumbprint a bit of chopped candied fruit, sparkling jelly, or tinted confectioners' sugar icing. Please join Bridget for 12 Crafts of Christmas over at the Ivey League. This week she is making jewelry and has a three different projects! 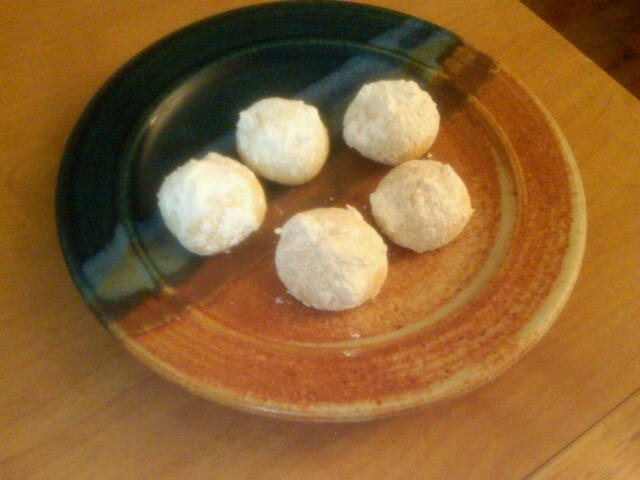 Seventh Place: Scotch Shortbreads, but a favorite with the over 10 crowd. Great with coffee! This smells as wonderful as it tastes! Mix crumbs,nuts, and butter into a food processor, and pulse until completely blended. Press mixture onto bottom and 1 inch up side of a 9-inch springform pan. BEAT cream cheese, and sugar with mixer until blended. Add canned pumpkin, spice, and vanilla; mix well. Add eggs, one at a time, mixing after each. Pour into springform pan. BAKE 1 hour 20 minutes or until center is almost set. Loosen cake from rim of pan, cool before completely removing rim. Refrigerate at least 4 hours, however I usually make it the night before, it taste better when it sits overnight. Serve with cool whip and a sprinkling of nutmeg to be fancy. Last year my girls and I bake our way through my Mom's 1959 Betty Crocker Cookbook. This year I thought I would share some of our favorite recipes. This post was originally published November 2, 2010. Believe it or not, there are only eight weeks until Christmas. Last year, my blogging buddy, Bridget, is posting a great weekly series called the 12 Crafts of Christmas. Frankly, I am not very "crafty", however it inspired me to go through my mother's Betty Crocker Picture Cookbook she received as a wedding present in 1959. Last year, my girls and I baked for 12 weeks and test out some vintage Christmas cookies recipes. 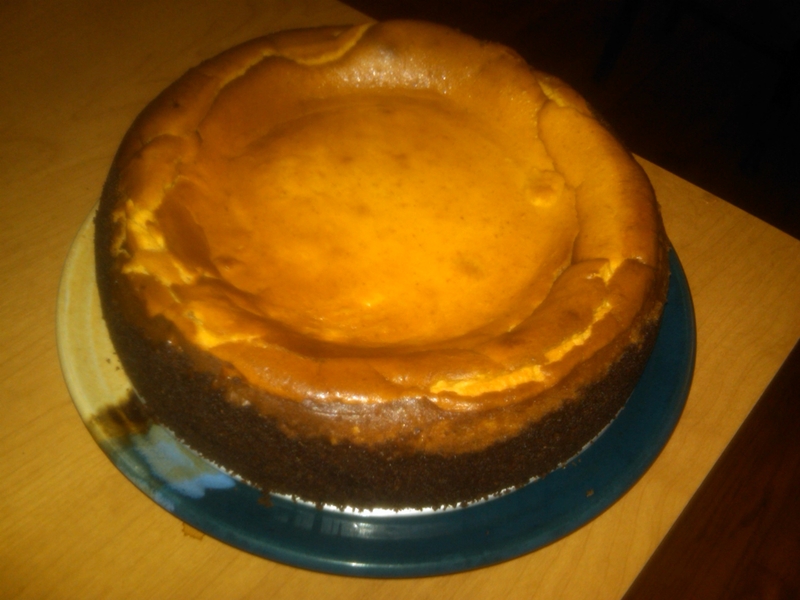 1/3 cup soft shortening, 1/3 brown sugar, 1 egg, & 2/3 cup molasses. 2 3/4 cup sifted GOLD MEDAL Flour, 1 tsp. soda, 1 tsp. salt, 2 tsp. cinnamon, 1 tsp. ginger. Chill dough. Roll out thick, about 1/4 inch. Cut into desired shapes. Place on a lightly greased baking sheet. Bake at 375 degree oven until when touched lightly with finger, no imprint remains, 6-10 minutes, makes about 12 gingerbread men. So far, the four children who eat them this week, said they were yummy. This post is part the Moms' 30 Minute Blog Challenge and hosted by Jamie at Steady Mom. So this is week two of our 12 Cookies of Christmas series. 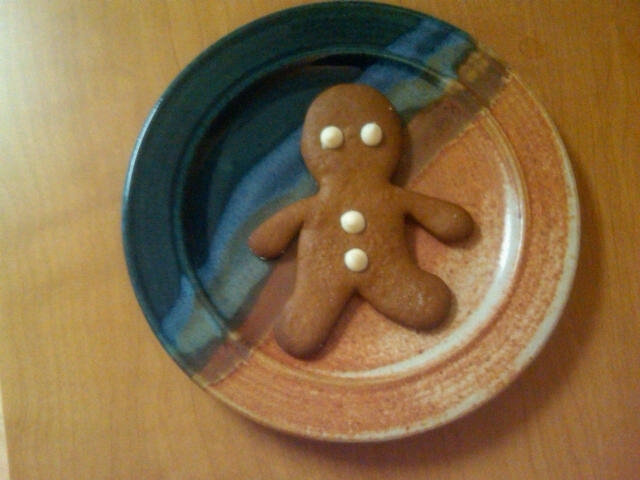 Last week, we baked gingerbread men. This week we baked pumpkin cut-outs using the Merry Christmas Cookie Light Dough recipe found in my Mother's Betty Crocker Picture cookbook (circa 1959). 2 3/4 cups sifted GOLD MEDAL flour, 1 tsp.soda, 1 tsp. salt, 1 tsp. lemon extract. Chill dough. Roll out thick(1/4"). Cut into desired shapes. Place 1" apart on lightly greased baking pan. Bake in a 375 F degree oven about 7-10 minutes until when touched lightly by finger, no imprint remains. When cool, ice and decorate as desired. 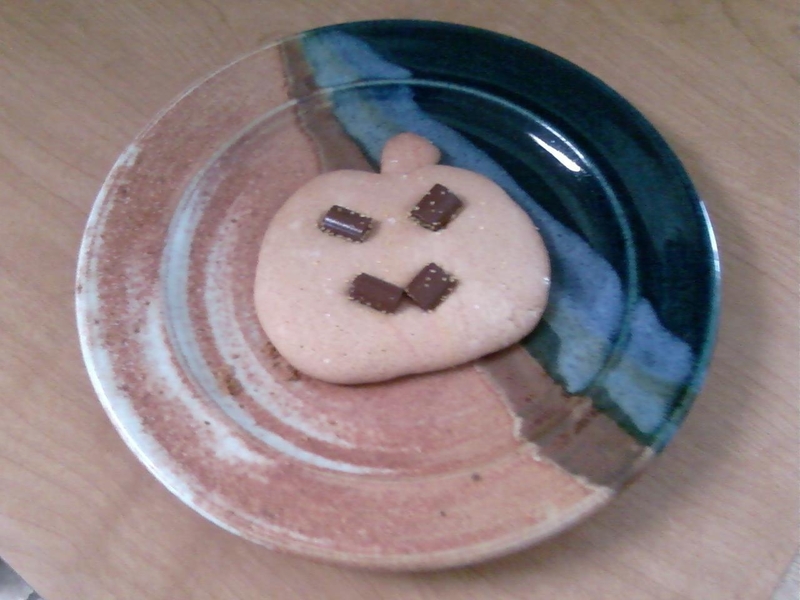 We decorated with chocolate chunks while the cookies were still hot to make scary pumpkin faces. My taste testers, ages 3 and 5, liked the light dough very much. It has a distinct honey taste with a hint of lemon, a very homey and old-fashioned cookie. For great Christmas craft ideas, please visit my friend, Bridget. This week her kids are making personalized clocks for the grandparents, very cute! This post is part of the Moms' 30 Minute Blog Challenge hosted by Jamie at Steady Mom. A Party? Sure, I'm Reddi! No Tackle It Tuesday this week, my friends. We are on a week of Staycation Vacation. No better way to start our week of relaxation and fun, than a party, especially if the party is at my friend, Carmen's house. She hosted a Reddi-Wip Party on Sunday afternoon. Yes, this girl is smart! Carmen can COOK, and so can her Mom. Everything was delicious, Pork BBQ, Ham and Cheese Sliders, and lots of fresh veggies. Lemonade for the kids, and Fruity Frozen Vodka Slush for the adults. That slush was VERY good. Of course, dessert was an ice cream bar with homemade chocolate and caramel sauce, Black Magic Cake, and lots and lots of Reddi-Wip. For all these great recipes, click here! My family's favorite Reddi-Wip favor, Chocolate! I didn't even know they made Reddi-Wip in chocolate. "It taste like chocolate mousse, " my husband said. At 15 calories a serving, not that bad at all.